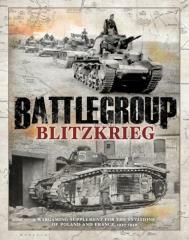 The next supplement for the 'Battlegroup' World War II gaming rules covering the invasion of Poland in 1939 and France in 1940. Designed to be played in 20mm and 15mm, this latest book contains army lists, vehicle data and special rules for the first two years of the war, including France's command chaos, the Luftwaffe's aerial superiority and the swift German Panzermarsch! Nine new army lists for the early war fighting. The Polish and German armies for 1939 and German Panzer and Infantry Divisions to fight French Light Mechanized Divisions, Armoured Divisions and Infantry Divisions, the British Expeditionary Force and Belgian army in 1940. Nine historical scenarios from Poland to Belgium and France. All in a lavish 184 page, hardback book. Heavily illustrated with inspiring miniature photographs, historical photographs and artwork.